Haeundae Beach represents Korean pocket beaches that are currently erosional and dominated by summertime typhoons. 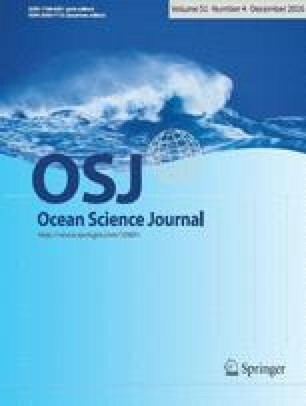 The decadal wave characteristics 9 km offshore of Haeundae Beach were analyzed using the WAM model that was validated through the 2007 wave observations. The wave statistics modelled for 1979–2007 indicates that the seasonal mean significant wave height (H s ) is highest (0.6–0.7 m) in summer due to typhoons, in contrast to the lowest (around 0.5 m) autumn analog. The wave direction is also pronouncedly seasonal with the principal bearings of SSW and NE in the summer and winter seasons, respectively. The WAM results additionally show that the H s has gradually increased over the region of Haeundae Beach since 1993. Beach profiling during June–November 2014 shows the opposite processes of the typhoon and fair-weather on beach sands. During a typhoon, foreshore sands were eroded and then accumulated as sand bars on the surf zone. In the subsequent fair-weather, the sand bars moved back to the beach resulting in the surf-zone erosion and foreshore accretion. A total of 5 cycles of these beach-wide sand movements yielded a net retreat (up to 20 m) of the shoreline associated with large foreshore erosion. However, the surf zone only slightly accumulated as a result of the sand cycles. This was attributed to the sand escape offshore from the westernmost tip of the beach. The present study may provide an important clue to understanding the erosional processes in Haeundae Beach.